Note: Since IEEE GOLD was renamed to IEEE Young Professionals (in 2014), these resources may not all be up to date. For more information about the change, see the section on the YP page. I am New, what is GOLD all about? How to start my GOLD Group? How do I set up an email list for GOLD members in my Section? How to set up web hosting for my GOLD Group? How to get funding for my event? How to apply for Quick Start Incentive Fund (QSIF)? How to get the IEEE GOLD Table-Top Display for my event? Where can I get a high-resolution logo for my pamphlet or poster? How to organize a meeting? How to recognize my volunteers and my Group? Where do I find resources from the 2006 IEEE Canada Regional GOLD Congress? Not sure what we are doing? Read this and it’ll all be crystal clear. GOLD Introduction: PowerPoint or PDF. File a completed petition as indicated here in Affinity Group petition form and procedures. The IEEE electronic communication services provide easy to use mailing lists. Please visit IEEE Electronic Mail Services for details. 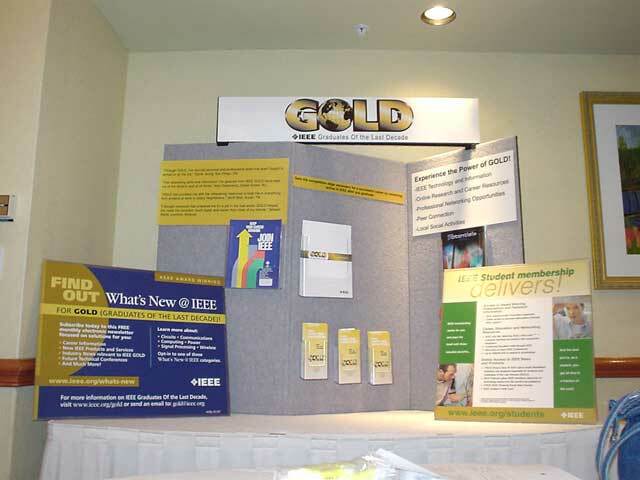 The IEEE GOLD Table-Top Display can be shipped to any GOLD group for temporary display at events at no cost to the local GOLD group. The shipping expenses are covered by the headquarters in New Jersey and there is no cost to use the display. Just need to make sure it is available and arrange shipment. It’s that easy to get promotional materials! Contact ?? to reserve the display. Do this early as the display needs to clear customs at the border. 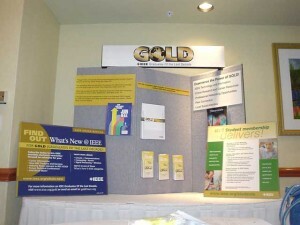 Let Cathy know if you also need GOLD brochures, application forms, posters, display materials, etc. Find out if GOLD groups near your geographical location or within Canada may want to use it soon after your event. If we ship it within Canada, it’ll be cheaper than shipping it back to US and then to another Canadian location. When you’re done, use the attached airbill to ship to another location or back to New Jersey if no one else in Canada needs it or someone already reserved it with Cathy. Planning, publicity, those details, run!, after the meeting, and reporting. Here are the important details which you can use as a check list to print and follow. Please see the links below for presentations, notes, reports, and other documents from the 2006 IEEE Canada Regional GOLD Congress.